July 1 is the Chinese Communist Party's (CCP) founding day. 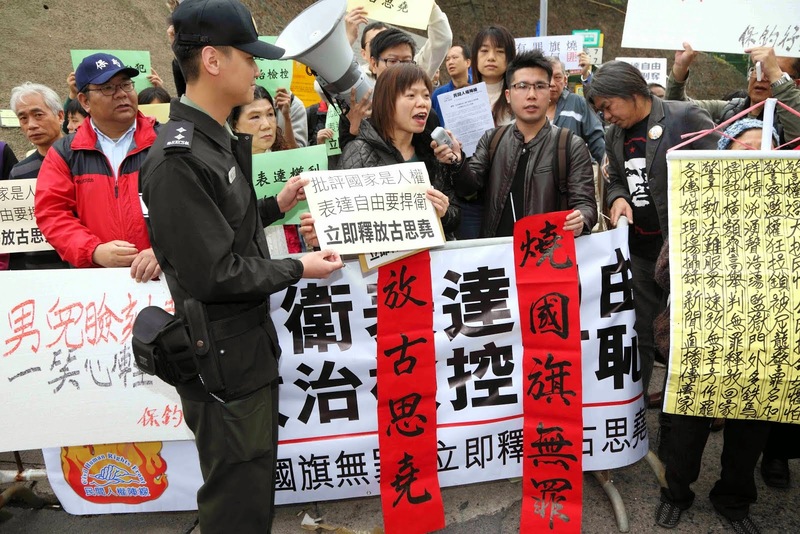 citizens took to the street, shouting "Down with the CCP." dubbed July 1 Anti-Communism Day. having chosen to abandon the CCP by this day. The following is our report. of society, sharing the same fate with the state and the people. is wishing the best to the state and the people." the 5,000 year culture of our people, our nation, into a bundle. It tries to confuse the difference between the party and the state. It claims that loving the party is being patriotic. and what you do is illegal and you are a traitor." ideologically emerged from the fear and terror of the CCP. 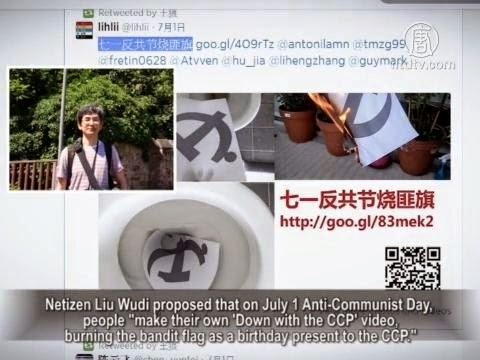 showing their objection to the control of the CCP. and send a wake up call to the international community. that read "No CCP in Hong Kong" while being interviewed. "Down with the Communist Party." Hu Jia, Beijing activist: "I believe those words are heartfelt. rule of law, freedom or human rights, but only endless pain." universal suffrage in Hong Kong, or freedom in China. the Communist dictatorship, and that is when faces its end. 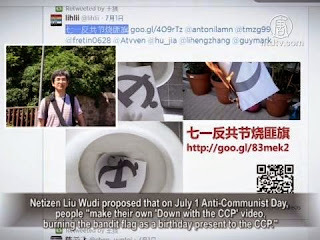 the bandit flag as a birthday present to the CCP." in the Anti-Communist Day in their own ways. to oppose this autocratic power. find their true voices, and realize the terror will not prevail. I believe this voice of resistance will get stronger and stronger." Liu Wudi says that July 1 is a very special day. the people condemn the CCP. has thus become "Global Quit the CCP Day." "Sticking with the CCP is surely a dead end. by quitting it and casting it aside." Chen Yunfei says the CCP regime's so-called "best period"
of rule is essentially its last struggle before its demise. will they gain true redemption of the soul. that will be the day the CCP crumbles. "奉旨朕钦奉隆裕皇太后懿旨：前因民军起事，各省响应，九夏沸腾，生灵涂炭。特命袁世凯遣员与民军代表讨论大局，议开国会、公决政体。两月以 来，尚无确当办法。南北暌隔，彼此相持。商辍于涂，士露于野。徒以国体一日不决，故民生一日不安。今全国人民心理，多倾向共和。南中各省，既倡义 于前，北方诸将，亦主张于后。人心所向，天命可知。予亦何忍因一姓之尊荣，拂兆民之好恶。是用外观大势，内审舆情，特率皇帝将统治权公诸全国，定 为共和立宪国体。近慰海内厌乱望治之心，远协古圣天下为公之义。袁世凯前经资政院选举为总理大臣，当兹新旧代谢之际，宜有南北统一之方。即由袁世 凯以全权组织临时共和政府，与民军协商统一办法。总期人民安堵，海宇乂安，仍合满、汉、蒙、回、藏五族完全领土为——大中华民国。予与皇帝得以退 处宽闲，优游岁月，长受国民之优礼，亲见郅治之告成，岂不懿欤!钦此。"
我惋惜的是，清帝逊位，若比较好的理想的两个宪法构建了理想的中华民国的话，那我们有一个承载着文明、文化之寄托的清帝，哪怕是在故宫、圆明 园有一个小朝廷，那也是承载中国文明文化的载体，也是挺好的事。三个逊位条例里，第一个主要问题就说只有尊号没有实权，就像现在的日本、英国的女 王，有一个文化的寄托是很好的，但由于后面的洪宪复辟、张勋复辟、溥仪的满洲国，把中华民国开局定下的，某种意义上歪打正着的机制彻底败坏了，文 化上老百姓不信这个玩意儿了，传统文明没有了载体，最大的遗憾在于通过几场反反复复的闹剧把本来有文化载体的东西在人们心里上的价值崩溃掉。一个 国家除了宪法制度之外，还需要支撑宪法制度的一种人的精神诉求，尤其像中国这样的传统文明的国家，除了一套制度之外，人总是要寻求一种精神上的寄 托，由于这些复辟把一些传统的把本来可以做起来的礼仪化的、虚拟化的文明载体的东西糟蹋了，现在很难再建起来，现在只能建中山陵、人民英雄纪念 碑，毛泽东红太阳，我们只能靠这些东西来承载人们对国家背后的精神寄托，但我觉得这些东西不如3000年的王道礼仪，王道的礼仪比这些正一些。现 在这些东西能够支撑老百姓的心理寄托吗?当然清朝还有一个华夷之辩，种族革命，比较复杂，但按当时来说，国民党所鼓吹的种族革命是对革命的发动作 用，他们自己都不主张种族革命是彻底有效的，而且按照康有为的考察，满族已经完全融入到中国的文明传统之中了，这点有争论，但至少来说原先有小的 寄托，但现在没有了这种寄托，这对10多亿人民来说，除了国家政权或者司法审查制度之外，精神寄托在什么地方?